The PBTA-200 push button temporary fire alarm is activated immediately by pressing the â€œmushroomâ€� button fixed to the front of the device. Once activated the unit will sound & flash. 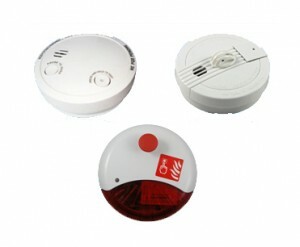 It can be used as a standalone alarm or interconnected in series. The ZT-ST5 & ZT-ST5/10 stand-alone photoelectric residential smoke alarms are NF approved and can be calibrated to either UL, BSI or VdS requirements. They feature VdS and UL-approved photoelectric sensing components with precise smoke detection and long life operation (1 year life with a 9V common alkaline battery) or (10 years with 9V Li battery). A proved quality with 10 million pieces installed over the world. Russian standard model available too.